This article assumes you have started creating a new promotion using the "Create promotion" option on the Home page. This opens the "Create promotion" wizard. The wizard simplifies the task of setting up a new promotion greatly. The internal name of your promotion. Never displayed to visitors of your store. Pick something that will help you identify this promotion in the list. Select a fixed discount code or allow Discount Ninja to generate unique discount codes for each visitor that clicks "Apply discount". This steps shows validation errors if any. If there are no errors go ahead and click the "Create" button. Click the "Test Discount Ninja" button to test your promotion. If you selected "Require Discount Ninja" you'll notice that the URL in the address bar contains a "token=ABCDE" component. This is what allows Discount Ninja to do its magic. If necessary, browse to the page(s) of the participating products. Click the copy button next to the URL to copy it to your clipboard. 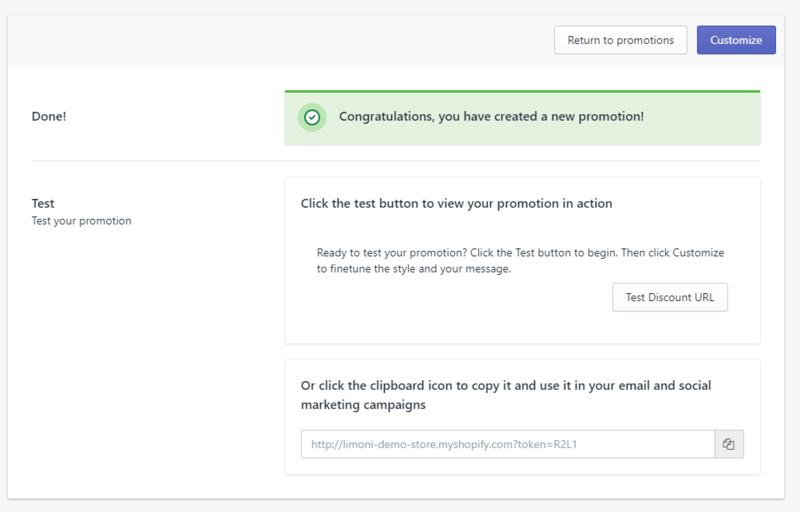 You can now paste it into an email, Facebook message... to share your promotion with your audience.